Charlotte’s WBTV interviewed Susan Harden and other commissioners about Mecklenburg County’s upcoming revaluation process, the first since 2011. 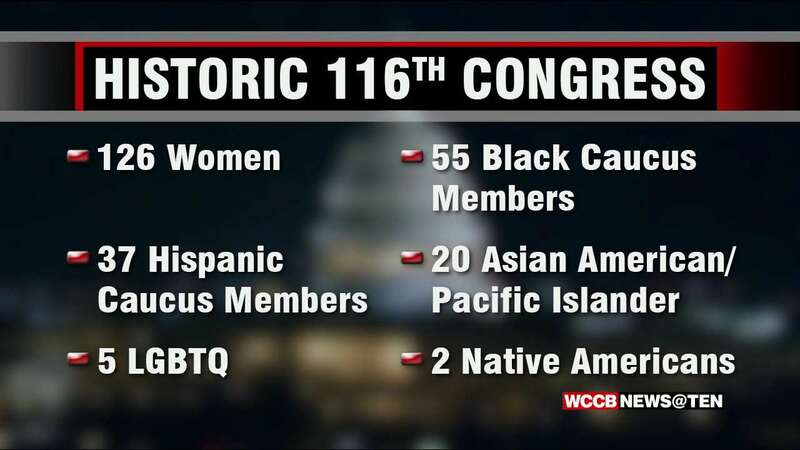 Susan was interviewed by WCCB regarding the swearing-in of the 116th Congress, the most diverse in history. Susan is one of three women recently elected to Mecklenburg County Commission. Susan Harden, along with other new Mecklenburg County Commissioners Susan McDowell (District 6), Elaine Powell (Vice Chair and Commissioner, District 1), and Mark Jerrell (District 4), were interviewed on WFAE’s Charlotte Talks to discuss their priorities. Listen to the show here, or watch the interview via Facebook video. The Black Women’s Caucus of Charlotte-Mecklenburg and the Charlotte Women’s March honored Susan Harden and 24 other local women during their 2nd annual recognition “Celebration of Women Elected to Office” ceremony on December 6. Read QCityMetro’s story on the event. Liz Foster spoke with newly-elected County Commissioners about affordable housing in this WSOC story. Commissioners agreed that housing is an issue that needs to be addressed. “It’s critical that areas like south Charlotte stay affordable for teachers and firemen and retail workers,” Susan Harden said. Susan’s first interview after winning her race for County Commission District 5 was with WBTV’s Molly Grantham. Here she shares that she’s thrilled to be a part of the “Year of the Woman”. “This means the issues that women care about may very well get addressed,” she said. “We know that when women run, women win. And when women win, they really do champion the issues in their lives." On Instagram last week, People of Charlotte shared my story about my Camino de Santiago journey to Portugal last year. Thank you, People of Charlotte, and Arden McLaughlin, for this great interview. It is an honor to be featured amongst so many fantastic Charlotteans making a difference in our community. As shared in the article, “I teach teachers to be community leaders; to engage the community,” and I appreciate People of Charlotte’s focus on our region’s leaders. As a professor at UNC Charlotte, I am passionate about teaching, about educating teachers, and about shaping our county with great education. “The fact that I’m an educator and a mom fits in with what Mecklenburg County does.” County Commissioners deal with human services; things like parks, schools, mental health, and libraries — the things that make us great. Find the entire article, and lots of other great features, at PeopleOfCLT.com. Susan B. Harden went to Washington a year ago to join millions participating in the Women’s March there and in cities across the nation and globe. She took to heart the call for more women to take on government leadership roles. On Saturday, Harden will head to uptown Charlotte to join this year’s Women’s March, where she’ll also launch her campaign to become a Mecklenburg County commissioner. A professor in teacher education at UNC Charlotte, Harden, a Cotswold resident, is seeking the District 5 seat. The district includes a vast range of south Charlotte neighborhoods, from Myers Park and SouthPark to the corridors of South Boulevard and Monroe Road. Harden believes her college degrees in economics and finance, her educational expertise, community involvement, and a long history of collaborating with people of diverse backgrounds have given her the experience and perspective needed to serve effectively on the county commission. Harden, a Democrat, says she wants to help find long-term solutions to the complex issues facing Mecklenburg County. She says she’d offer a fresh perspective on issues such as funding public schools, combatting the opioid epidemic and helping residents on fixed incomes facing rising taxes from escalating property values. She vows to work with colleagues across the political spectrum to make sound decisions about growth, infrastructure investments, public health and protecting the environment. Susan’s priorities include teacher advocacy; education reform, particularly improving teacher pay and access to early childhood education; healthcare advocacy to ensure access to healthcare, particularly for women and families; affordable housing for all sectors of the community; and pushing back against pre-emptive state laws that prevent Mecklenburg County from advancing solutions that make sense for our community. Susan and Brian Harden have been married for 25 years. They have two daughters, Anna, a UNC-Chapel Hill student, and Katie, who attends Myers Park High School.